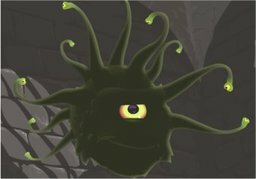 Lord Orbius is a massive beholder that appeared within Kazmojen’s human bazaar while the Moonhowlers were trying to run a rescue operation for the kidnapped children of the Lantern Street Orphanage. Orbius seemed to hold some power over Kazmojen, who groveled beneath the many-eyed monster. Orbius also seemed truly concerned for the fate of at least one of the kidnapped orphans. He also did not bother the party after Kenric attacked him, preferring to shrug off the magical assault. Later, however, Gerran received a letter from Lord Orbius, part warning and part thank-you. The mysterious monster has not been seen or heard from since.